At Beckertime we understand that your prized Rolex at some point will need something replacing be it a crystal or a crown. In a lot of cases it is not just what needs replacing, there are plenty of reasons for it such a damage or even something as simple as personal preference. If you want to maintain the integrity of the watch we have authentic Rolex accessories and parts available to keep your watch looking the same. So even if you need an extra link for a bracelet so that it fits, or if you want a whole new bracelet we can get it for you. We also offer third party aftermarket parts which allow you to change the appearance of the watch. With that in mind you can truly turn your Rolex into a unique and custom piece if you so wish. 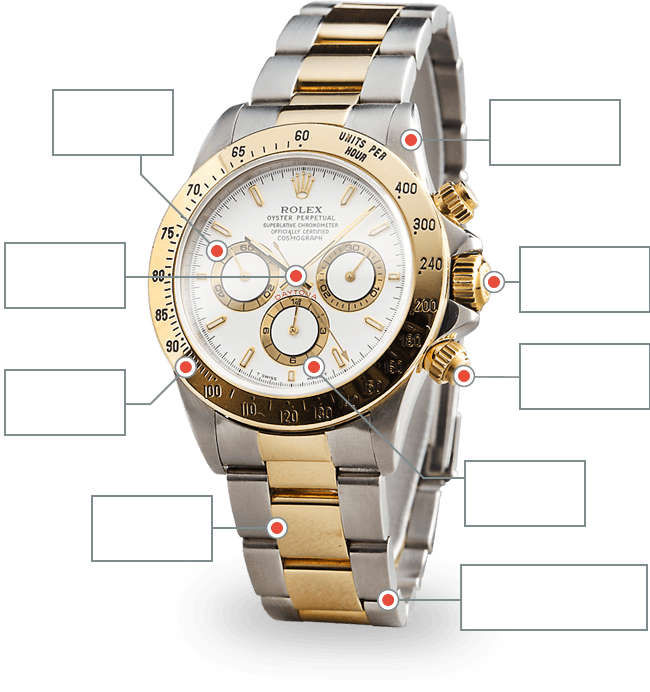 Sometimes it may even be the cost that determines whether you have the genuine and authentic Rolex parts or the third party aftermarket ones. Rolex Bezels come in a variety of colours and styles, the most common being the fluted bezel design for the Rolex Datejust. We have some Rolex and aftermarket gem set bezels if you feel the need to add that little bit of additional sparkle to your prized timepiece. However careful you may be an accident may occur and you could damage the bracelet on your watch. The bracelet is an integral part to every Rolex, with the pride that Rolex takes in the engineering of each bracelet design. We stock a large number of Genuine Rolex bands and bracelets just in case you have an accident, or if you just fancy a change. The main ‘body’ of any Rolex watch. This particular item you would only really change if the damage was beyond repair, but all the cases we stock are Genuine Rolex ones. Possibly the most important part of a watch as this is what all other parts are attached to it. Screw down crowns and now the new trip-lock crowns are a thing of Rolex lore. At Beckertime we have the pushers and crowns in an array of materials and are model specific ready for your needs. The chronographs in the Rolex Collection, the Cosmograph Daytona is the one where you may need additional pushers. Always worth keeping these pieces looking pristine. The window to the beauty within your watch. The sapphire crystal of any Rolex is one of the most common things to have damage, or a slight scratch. Especially those cyclops found on Rolex watches with a date function. We offer both Genuine and aftermarket crystals in both Sapphire Crystal Glass and acrylic. The main thing you look at on any watch is the dial, rather important for telling the time. Beckertime stock a huge variety of Genuine Rolex Dials. Options for the most popular watches are all available, from diamond studded hour markers to Arabic or roman numerals. In a whole host of different colours and materials. The constant sweeping of the second hand is a hallmark of most Rolex watches, never truly ticking. All this is seen through the slender and beautifully engineered hands. Just as important to the overall watch as everything else. At times we also have in stock Rolex accessories such as Rolex Watch Boxes, Rolex Watch Pouches and even things like keyrings and pens. Though these times are extremely rare they do appear once in a while. The perfect gift for any enthusiast of Rolex watches and the Rolex Company. As you can see we have almost everything to suit all tastes and budgets, whether it is a simple repair, replacement or customisation. Your watch will be in good hands with every available option at Beckertime. Any Rolex owner or collector has a library to learn more about this illusive company and its many products, not to mention its long and varied history too. All the books in Beckertime’s library are industry standard and referenced by experts for the countless fine details within the Swiss watch industry. A real must for all serious watch fans and collectors who want to know as much as they can about Rolex and other Swiss Watch Brands. Select the part of the watch you would like to purchase.